The semi automatic F1 system was first introduced by Ferrari back in 1998 on the 355 and was carried through onto the 360, 575, F430, 612 and 599. The system is very similar to the Maserati Cambiocorsa or Duoselect and the Alfa Romeo Selespeed systems so much of what is written here will also apply for those systems as well. There is a lot of misunderstanding regarding the operation of the F1 clutch system and how to set it up properly. I hope to be able to demystify this topic and also challenge some of the common assumptions. Firstly, clutch wear. Many people dismiss the F1 system purely because of the horror stores of clutches wearing out in under 5,000 miles. Although this is possible, is entirely down to set up and driving style. A properly set up and considerately driven F1 clutch can last as long as it’s manual counterpart. In order to understand how to set and drive an F1 clutch, one must first understand how the system works. And in order to do that a basic understanding of how a clutch works is necessary – this animation provides a very good introduction (I can take no credit for it though). The F1 clutch operates in the same way as a regular dry plate clutch, except the position of the release bearing is controlled by the Transmission Control Unit (TCU). The TCU commands a solenoid valve which pumps clutch fluid to the slave cylinder. There is a small magnet on the release bearing which, in conjunction with a Hall Effect sensor, tells the TCU its position at any point in time. One of the most important parameters used during the clutch operation is the Self Calibrated Closed Clutch Position (CCP). This is the distance, in mm, of the release bearing from the flywheel when the clutch is fully closed. In order to open the clutch, the release bearing must move towards the flywheel (forward of the CCP) and act on the diaphragm. The action of the release bearing between the Clutch Open Position and CCP is carefully controlled by the TCU and choreographed in conjunction with the torque output of the engine. 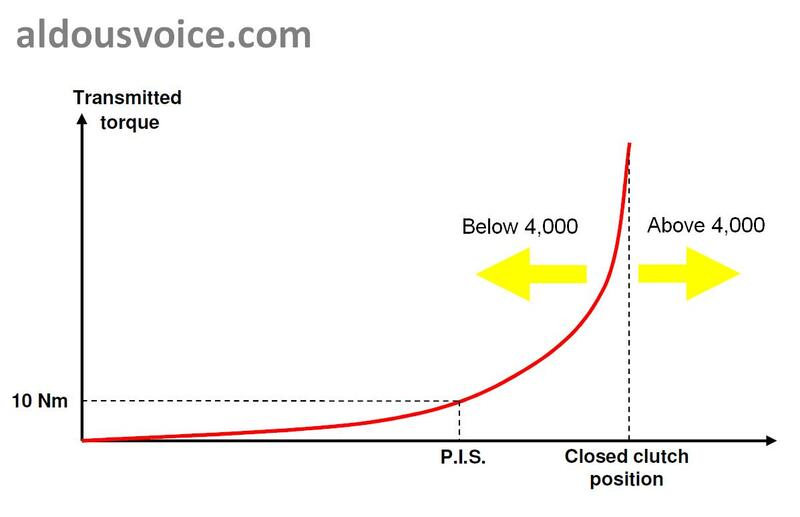 The other important parameter is the Punto Incipiente Slittamento (PIS), slip beginning point in English. This is the distance from the CCP that the clutch first starts to bite on the flywheel. It is measured in mm. 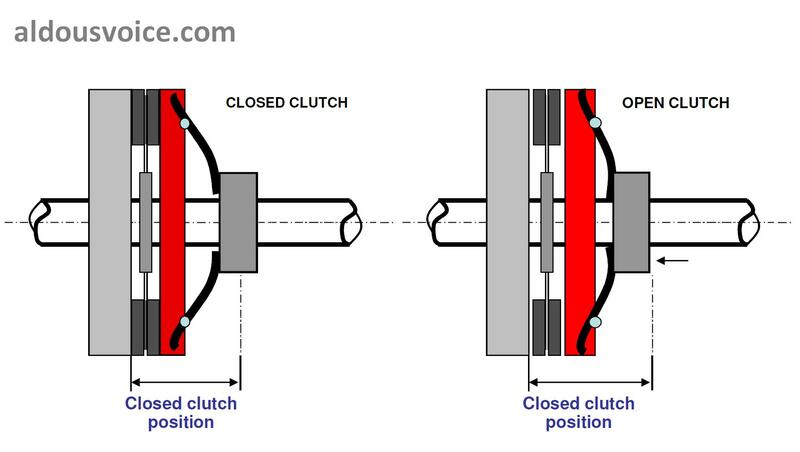 The operation between the clutch being open and fully closed is most important when pulling away. The torque differential between the stationary road wheels and the flywheel of the engine is huge and the TCU has to carefully balance the engine output with the motion of the clutch (in the same way a driver would in a 3 pedal car). 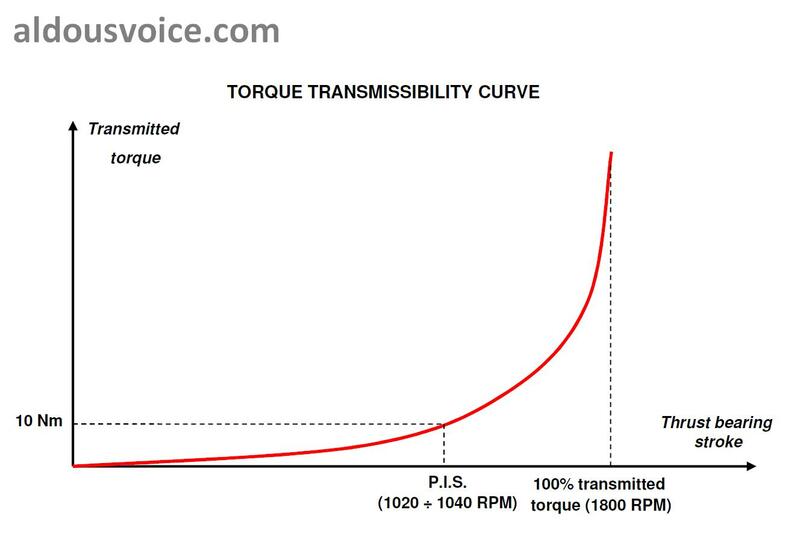 The TCU manages this operation using a Torque Transmissibility Curve, shown below. This curve shows the relationship between the clutch position (x-axis) and engine output (y-axis). As the driver increases the speed of the engine the clutch starts to close. 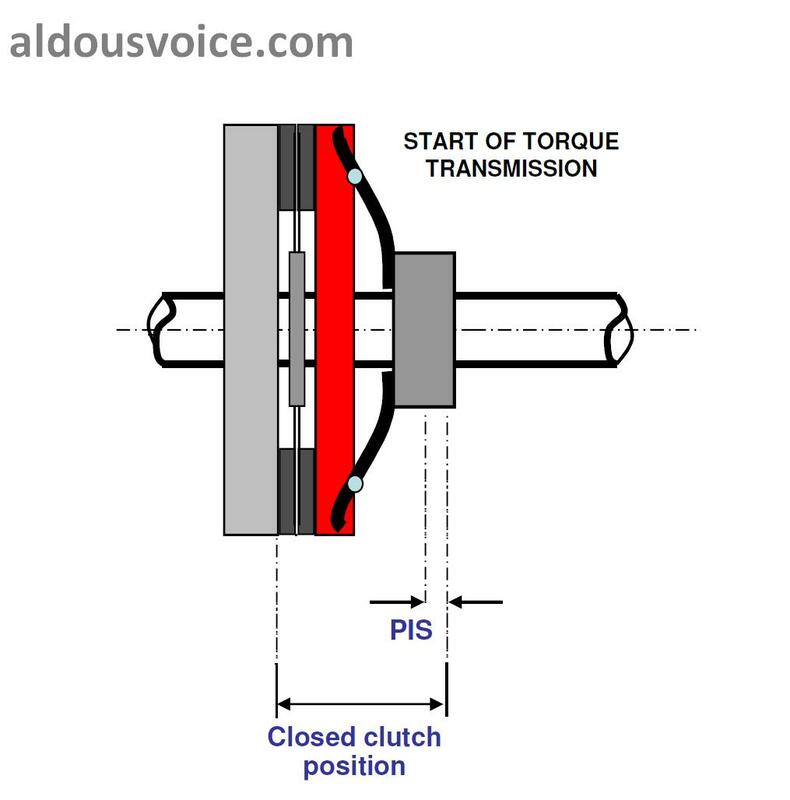 When the clutch reaches the PIS the engine output is increased exponentially until the clutch is fully closed. This curve can tell us a number of things. Firstly, when pulling away from standstill the clutch is not fully closed until the engine speed reaches 1,800 rpm. This means that slow speed manoeuvring (forwards or backwards) has a detrimental effect on clutch wear. This is compounded if trying to overcome the force of gravity. Secondly, if the driver reduces the output demand on the engine (by lifting the accelerator pedal) whilst the clutch is being closed the TCU will open the clutch and then start to close it along a different curve appropriate for the new request from the pedal. This can cause the jerkiness that many drivers new to the F1 system complain of. My advice to new drivers is to progressively increase the engine speed as the car is pulling away. This makes the TCU close the clutch more quickly and results in a smoother operation. The most important point though is the accuracy of the PIS. If the TCU expects the clutch to be biting into the flywheel at a certain point it will also expect to see movement of the gearbox input shaft. If the PIS is wrong then the TCU won’t detect this movement and will try to compensate by opening the clutch and trying again. This causes a very jerky take off and dramatically wears the clutch. The TCU also calculates a parameter called the Clutch Degradation Index (CDI). This is a measure of how good the clutch is at transmitting the torque and is auto calibrated every time the clutch is closed. It is a number between 0 and 10,000, with the default value of a new clutch being 4,000. A clutch with a CDI of below 4,000 is biting brusquely and operating well. CDI over 4,000 indicates that the clutch has a tendency to slip. The normal value for CDI is 3,000 to 4,000. The TCU uses the CDI to adjust the Torque Transmissibility Curve. If the clutch is deemed to be biting well then the TCU will close the clutch more quickly (and vice-versa). This also has an important lesson for the driver. If the clutch is slipping a lot then the TCU takes even longer to close the clutch and thus the smoothness of the gear change is even more negatively impacted. Clearly, have the PIS set properly is paramount. An incorrect value for the PIS can cause rapidly increase the wear on a clutch. If the value is too high then the TCU will hunt to find the bite point and slip the clutch. Too low and when the car is stationary and in first gear, the clutch will be dragging on the flywheel. Another mistake is not to reset the CDI when renewing a clutch. Invariably a clutch will be replaced when it is wearing out and is therefore likely to have a high CDI. If this parameter is not reset then the new clutch will be operated with a stretched out Torque Transmissibility Curve, increasing wear. For owners with early TCUs, the PIS is not directly adjustable and is calibrated by the TCU upon request (using an SD2 or similar). However, this auto calibrated value is not that reliable and is often set too high. So where does this leave us? In my mind it exemplifies the need to have the clutch parameters set up properly by someone who knows what they are doing. It also pays dividends to have these parameters regularly checked during ownership. Any technician worth their salt will offer a free re-check on the parameters after they have altered them. If you are located in London or the South East of the UK then I would be happy to check your parameters for you – please take a look at my Services page. Brilliant and insightful post Aldous, completely demystifies the F1 clutch operation, and although I run a manual F360, it must be of great help to any F1 owners out there. Aldous, this is an incredibly high quality piece well written and invaluable for current and prospective owners. Presumably most of this also applies to F430 F1 cars too? I have to say mine is shocking at reversing especially from cold. Sorry, yes – I should have been more specific and said it applies to all single dry plate F1 clutches, including the F430. Great post….thank you! At what time or mileage interval should the clutch parameters be checked? My clutch was replaced just before I purchased the car 12 months and 5,000 miles ago. I do notice that upon moderate acceleration from a stop there is rise in engine RPM then a momentary drop before rising steadily again. Ideally, the parameters should be checked and adjusted as part of an annual service (along with checking the parameters in both engine ECUs). Next time your cars goes in ask them to give you a print out – feel free to email it to me if you want some help interpreting the data. You mention the CDI auto calibrates every time the clutch is closed. Then does it matter if it’s been reset with a new clutch or not? Inversely if I don’t think it’s been reset, and I reset it on a clutch that’s already seen a few thousand miles of usage, would it cause strange behaviors or would it auto calibrate to the appropriate # after it’s been closed once? Lastly you said the clutch will be fully closed at 1.8k rpm. How does that work when I’m inching along at low speeds like adjusting my car in the garage? When I did it I know the clutch is slipping at similar rpm, how does it know not to close the clutch and either stall or send me into the wall? Thanks so much, and your site is great! Thanks! That is very helpful! Do you have a glossary you can share of the F430 SD3 system parameters? Also, is it bad to have a CDI (same thing as clutch wear index?) below 3000? A CDI below 3,000 is good.